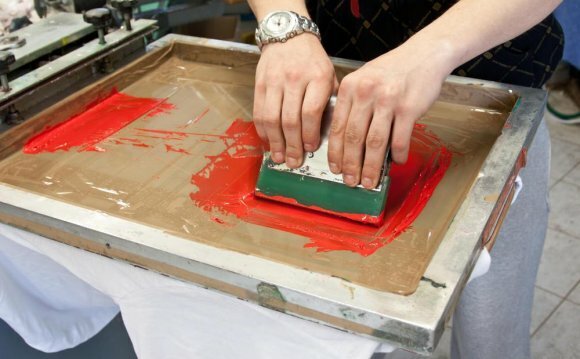 You will need a computer printer to make film positives for screen printing as well as making digital heat transfers. You can make film positives with laser or inkjet printers but it seems that inkjet printers dominate the market for film output. There are many good inkjet printers that will do the job just fine but Epson has the advantage of being able to work with many brands of RIP software. Many Epson inkjet printers can be converted to all black inks specifically made for creating film positives with RIP software for screen printing. And it seems that RIP software creators make their programs work with many different models of Epson printers. Most tee shirt printers use a system like this in house. Epson has the reputation of being the best photographic printers in that they can reproduce digital photographs with excellent detail and quality. Therefore, an Epson inkjet printer would also be an ideal choice for printing your digital inkjet heat transfers. The image quality and color saturation from an Epson printer will be perfect for tee shirt designs printed on heat transfer paper. There are also laser film positives and heat transfer papers that work with laser printers. But because inkjet printers dominate the film output market for screen printing, the selection of printers below is limited to Epson inkjet printers most suitable for inkjet film output or inkjet heat transfers. These are the Epson printers I chose that I thought were best suited for making film positives for screen printing or creating heat transfers. With an Epson, you have the ability to do great heat transfers and if you ever screen print, you will be able to use the same printer to make inkjet film positives. I own an Epson 1400 now and I use it to make film positives. It's a great 13"X19" printer at a reasonable price. But you may not need such a big printer, just keep in mind that in order to make bigger designs to screen print or heat transfer, you will need a bigger printer size. The following items are here as a suggestion only. Catspit Productions does not recommend, endorse, promote or advertise these items as "tested for screen printing". It is up to you to make sure the items listed will do the job to your satisfaction.